After digging our well, we had the water tested for over a hundred different possible problems; the good news is that it had only two deficiencies. The beautiful stones in this county have iron deposits all over them, so we weren't surprised to learn that our ground water had iron in it too. (about 4 grains per gallon) The other problem with our water was that it had a low ph. (roughly 6.2) For a while, we lived with the iron in the water, but it was staining our fixtures, so we decided to fix it before the stains became permanent. There are two major forms of iron that can be present in water supplies... "ferrous" (dissolved and temporarily invisible) and "ferric" (oxidized and visible). Our water test showed that ours was primarily the ferric form of iron... which is common in dug wells where the water has had ample time to come in contact with oxygen. It's also the easiest form to remove. 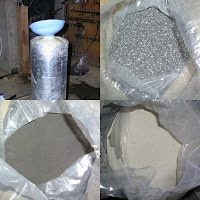 After researching on the internet (and experimenting with disposable filters, which temporarily worked before clogging with iron), I decided to use a filter tank (shown at left) with back-washable filter media in it. I was relieved that I wouldn't need a water softener that requires adding salt all of the time. Because city water has recently been made available to many areas of our county, spun-fiberglass filter tanks are sitting unused in basements and cellars. My in-laws gave me one of theirs. The first thing I did was to dispose of the clunky and complicated backwashing valve-set on the top of the tank. (more on that later) After reinstalling the down-tube in the middle of the tank, I poured in crushed garnet, Birm, and Chemsorb. The garnet doesn't really filter anything - it's just a heavy bed for the other media to rest on. The Chemsorb filters out the ferric iron as does the Birm. But the Birm will also convert a small amount of ferrous iron to ferric iron if it is present in the water and if the ph is in the proper range. Either media alone might have worked for my application, but I couldn't decide, so I used both! I installed a manual ball valve on the filter tank, so that when I opened the ball valve, pressurized water in the blue expansion tank pushed water backwards through the filter tank, thereby floating the media in the filter tank, and flushing the iron out a garden hose. I also installed a second check valve on the line coming from the well - to make sure my setup didn't push rusty water back into to the well. I worked the ball valve manually every day for a few weeks, watching the color of the back-washed water to see how long the backwash cycle needed to be in order to get all of the iron out, without wasting too much water. (the answer, 2 minutes at about 5 to 8 gpm) About two weeks into my test run, the system stopped working, and tons of iron started coming out our faucets. Blechk. But we were also getting some air in the lines occasionally, so I had a theory... It turns out, the rubber bladder in the blue expansion tank had burst. The blue expansion tank still worked, but the ruptured bladder let water come in contact with the inside of the metal tank, forming rust downstream of my filter system. I called the expansion tank manufacturer and had them send me a new bladder. Once I installed it, my system started working fine again. The final step was to automate the back washing function. For less than $40, I bought a battery operated sprinkler valve from Lowes, and set it to open up for 2 minutes every night at 3:00 am. The system has been working great for over two months now. The media is supposed to last for at least 5 years, and I hope it does! This picture shows (from left to right) the sprinkler valve, the manual ball valve (always open now), and the brass check valve on the line coming from the well. #2 My well pump is configured to spray water back into the well, so that oxygen levels are always high in the well water. I think this helps make sure all of the "ferrous" iron becomes "ferric" iron before it gets to the filter tank. I also think this helps kill bacteria in the well, without using chlorine or other methods. #3. I haven't fixed the ph problem yet. The water is safe, but the low ph will possibly cause corrosion in my copper pipes. In fact, my water leaves a green ring in the bath tub... probably from my copper pipes. I have 50 pounds of calcite that I plan to pour in the well to see if that will work. (I've read that it will!) Acidic water should not be a problem in areas where limestone is naturally occurring in the ground. Such is not the case on our farm. We have curtains for interior doors, no kitchen cabinets, and no baseboard trim, but that hasn't kept us from moving in. 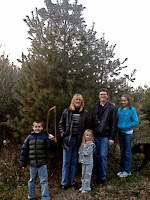 There are very few pine trees on our farm, so last week, after the kids got out of school, we went to farm about 15 miles west of here and cut our first Christmas tree for the new house. When we got back to the house, I took the spare tire out of the back of my truck and bolted the tree to it to keep it upright. I just hope I don't have a flat tire out on the road before I get the tire back in my truck. Rhonda and the kids have done a great job decorating it. The two younger kids got bored quickly though, and moved on to a game of cards. Our older boy wasn't there for the tree cutting, so he's the one on the ladder decorating it.